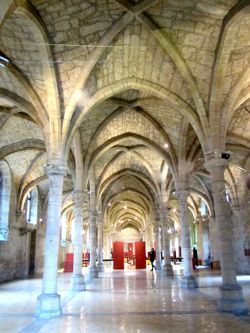 Dijon has wonderful museums, and most of them are free! Dijon has a fine collection of museums, and the city has made most of them free to the public. So it's easy to wander in and out and see them at your leisure. Note that museums in Dijon are closed on Tuesdays. 14th century crucifixion altarpiece, Musée des Beaux Arts. Just next door to the Musee de la Vie Bourguignonne is the Musée d'Art Sacré. This is located in the former Bernardine Church, with its distinctive green dome. 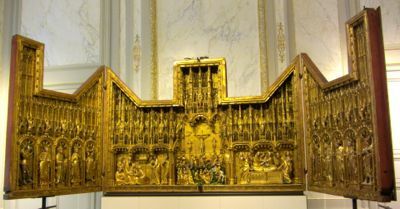 It displays a permanent collection of various church-related art objects, and also hosts frequent temporary exhibitions. For example, when we visited the focus was on modern sacred works by female artists. Another museum housed in a former abbey is the Archaeological Museum, next to the Cathédrale St-Bénigne (map). Its collections are extensive and include paleolithic artifacts, many items from the Gallo-Roman period, and more. There are also some private museums in Dijon, such as the Musée Magnin, a large collection of paintings in an elegant 17th century mansion. 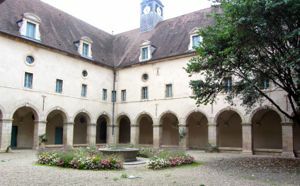 Above, Musée de la Vie Bourguignonne, in the cloister of the former Bernardine convent. Below, The Archaeological Museum, lso in a former abbey next to the cathedral.